Killer is the exciting live roleplaying game for intelligent, creative and slightly uncivilized people – people who want to knock off their friends . . . without hurting them. 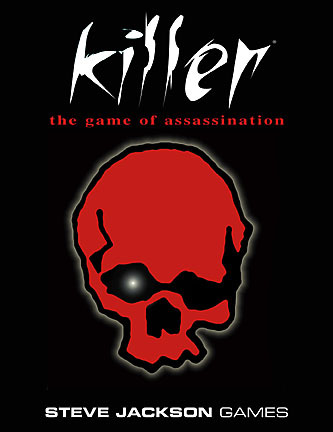 Killer was the first live roleplaying game, and it's still the first one that most people encounter. This old favorite will soon be back in print, with more and better ways to "kill" your friends (without hurting them, of course). Besides the basic game, there are 16 different advanced scenarios . . . games that set the players up as everything from 1920s mobsters to modern-day vampire hunters. Also included in this new, expanded edition are hundreds of gadgets, strategies for devious ways of bumping off your friends, safety tips and more. Kill Evil Stevie! – a Killer scenario for conventions. Bruno plays the "Kill Evil Stevie!" scenario. Discuss Killer in the Steve Jackson Games Forums. Rebecca's – a source of Killer weapons; their "Soft Missile Gun," which we bought in November 1998 for $12 a dozen, is a truly fine Killer weapon . . . not as powerful as Nerf guns, of course, but plenty of bang for a buck. And they shipped to us very quickly, too. Thanks to Mike Cowper for locating this source! NerfCenter has news, forums, reviews and previews of a wide variety of Nerf weaponry.